There is one feature on the Fuji X-T1 that might most of Fuji-user think it’s only a gimmick: tether the camera to smartphone/table through Wi-Fi. To be honest, at the beginning I thought the same way. This feature was somewhat created for the facebook or any social media generation, the one who would like to share their selfies immediately through mobile internet, upload into facebook and any other social media, which indeed, they can do. But unfortunately, it’s NOT me. But well, this X-perience of using Wi-Fi features has changed my thought. It was in the beginning of March, even though for some areas it’s a start for Spring but not in the Zermatt, a village located in the southern Switzerland’s Valais canton, is a mountain resort renowned for skiing, climbing and Alpine recreation. The village (elevation 1620 m) is set below the iconic, snowcrapped Matterhorn peak. 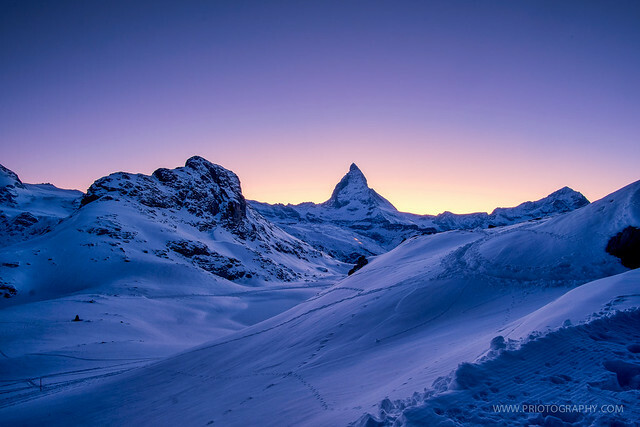 At night in Zermatt, the temperature would be about -5°C which is felt as like colder than that. My first passion when I came there for vacation is capturing the village from a top, with Matterhorn peak on the frame within blue hour. Trying to create an iconic picture as a beauty memory of this lovely place. So, I hike the hill on the south-east part of the village to get a view. Once I was there, I felt even colder and I noticed that I could not move easily X-T1 with my thick gloves. The Wi-Fi features of X-T1 became my saviour. I could control anything on my bloody-cold finger. ISO, shutter speed, timer, aperture or even white balance. And you’d never imagine that this features is beyond my expectation. I could even from my iphone do editing with Snapseed apps, and upload directly to facebook to share all my fuji lover’s mates. I found that to get connected to Remote Control apps on iphone is less complicated. On Android devices, as I have heard, you need to tap OK several times on both the smartphone and camera a couple of times. Turn on your camera and press the WiFi button then the WiFi icon will start flashing while the search is on. If your smartphone is connected to other WiFi, please deselect and select to the WiFi channel of your X-T1 (or other fuji camera). Launch the Fujifilm “Camera Remote” app then you shall be connected to your camera. For android, you will need to depress the green Connect and check the rear LCD screen of your X-T1 if the name of your smartphone appears, then press OK.
Once the connection smartphone and X-T1 is established, the screen on your X-T1 will switch off and the same time on your smartphone will show X-T1 live view. The app not only lets you adjust focus but also control settings like shutter speed, aperture, exposure compensation, ISO sensitivity, and WB. The Film Simulation, self-timer and flash could be also full control in your hands thru your smartphone. The “touch AF” technology you could also do. Tap your smartphone on the area that you need to focus, the the camera will do for you. Even in the Video Mode you could do everything as you set the camera thru viewfinder. The day after, I hiked close to the top of the Matterhorn’s peak. Seeking a small lake so-called Rifflesee located at one of the hill of the Matterhorn, getting the golden hour so that I could capture the reflection of the holly goldy Matternhorn on the lake. After hiking about 5-6 km, about 1-2 hours with bloody cold weather I suprise that I could not even find the lake. Obsessed to the mountain, I spent about 2-3 hours there to get a place that having a good composition where the sun would set behind the Matterhorn and let the light spread to give a dramatic frame of the Matterhorn’s peak as you see below. This time I would test the Remote Control apps to remotely release the shutter speed for night shots free for camera shake while I sat relax on the dry stone taking picture second by second, be a witness of the great scene sunset that I have ever seen. Alone. reading your blog posts is a great deligyt to me. And what generous gift! so your tips iis going to be put to fine use.